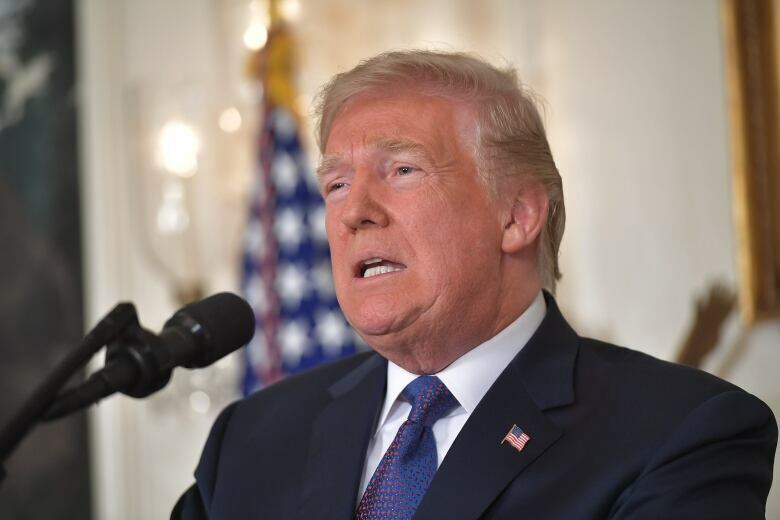 U.S. President Donald Trump, along with France and the U.K., launched what he called "precision strikes" against targets associated with Syrian President Bashar al-Assad's chemical weapons, saying the strikes were a bid to deter future chemical attacks. U.S. president says combined operation with France, U.K.
U.S. President Donald Trump, along with France and the U.K., launched what he called "precision strikes" against targets associated with Syrian President Bashar al-Assad's chemical weapons on Friday, saying the strikes were a bid to deter future chemical attacks. The strikes were in response to an alleged chemical attack last weekend in Douma, a community not far from Damascus. Activists say the attack killed more than 40 people and injured many more — but Syria and its ally Russia have issued various denials. U.S. military officials told reporters Friday night that the strikes, which targeted three sites, are over for now and there are no additional attacks planned. 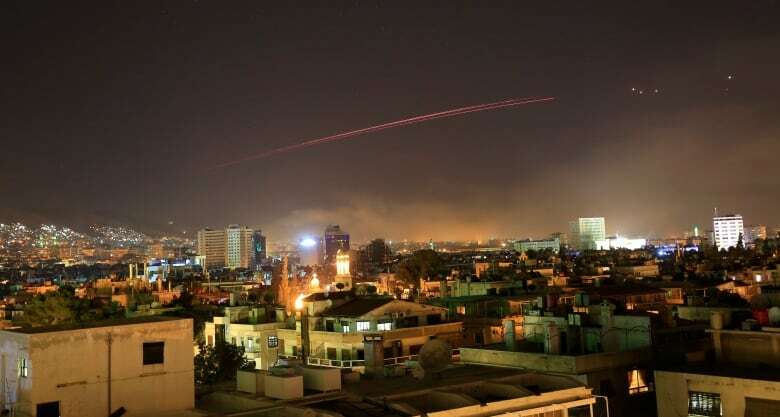 The Syrian military said nearly 110 missiles hit targets in the capital Damascus and other territory, and that air defence systems brought most of them down. "Such attacks will not deter our armed forces and allied forces from persisting to crush what is left of the armed terrorist groups," the military said. Russia, which has said chemical weapons were not used in Douma and accused the West of fabrication, also reacted swiftly. "Our warnings have been left unheard," said the Russian ambassador to the U.S in a statement. "A pre-designed scenario is being implemented," Anatoly Antonov said. "We are being threatened. We warned such actions will not be left without consequences." What those consequences might be, however, wasn't explained. When Trump announced the strikes Friday evening he said the U.S. is prepared to sustain the response "until the Syrian regime stops its use of prohibited chemical agents." But he also said the U.S. "does not seek an indefinite presence in Syria, under no circumstances." He described the horrors of chemical attacks and said "we never want to see that ghastly spectre return." 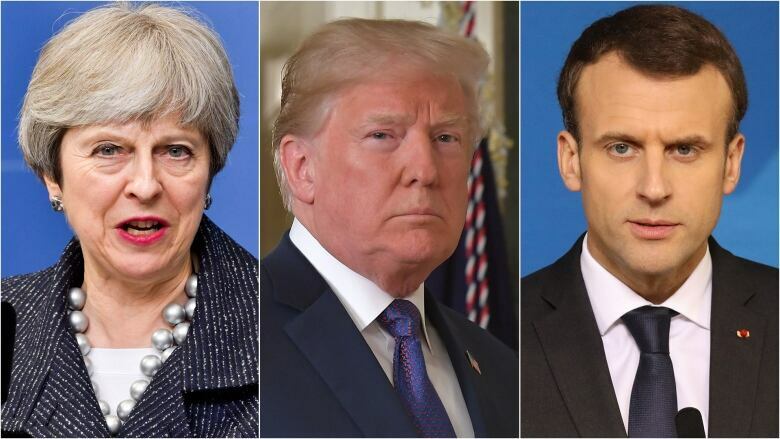 "So today, the nations of Britain, France and the United States of America have marshalled their righteous power against barbarism and brutality," he said. British Prime Minister Theresa May said in a statement that the strikes should come as a surprise to no one. "We have sought to use every possible diplomatic channel to achieve this," May said. "But our efforts have been repeatedly thwarted." Ahead of the strikes, Russia said its experts had been on the ground in Douma and found no sign of chemical weapons. Trump lambasted Assad during his address — but he also had harsh words for Russia and Iran, blasting them for financing and equipping the Assad regime. "What kind of a nation wants to be associated with the mass murder of innocent men, women and children? The nations of the world can be judged by the friends they keep." The Associated Press reported loud explosions lighting up skies over the Syrian capital of Damascus, along with heavy smoke. Syrian state TV said the army's air defences were confronting an attack by the United States, France and Britain. U.S. military officials said they had encountered some surface-to-air missiles in response to the strikes. 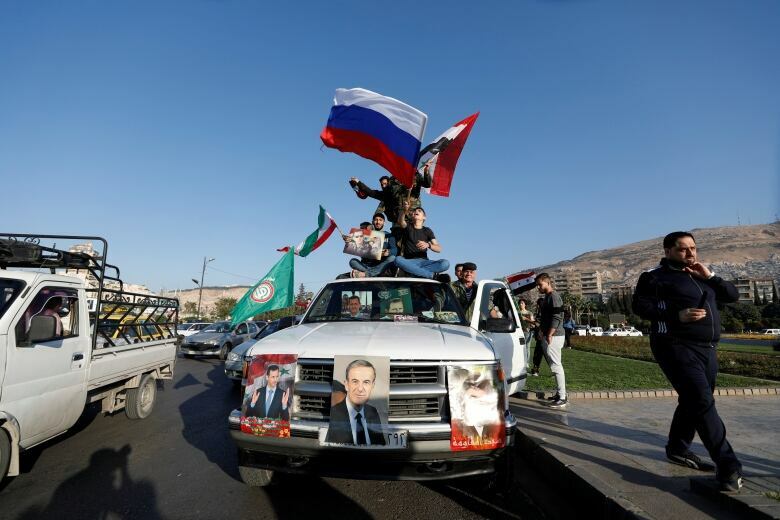 A senior official in a regional alliance that backs Damascus told Reuters that they "absorbed the strike" and are assessing damage. They said the bases were evacuated "days ago" after an early warning from Russia; the French defence minister did say that Russia was warned ahead of the strike. Speaking to reporters at the Pentagon, Defence Secretary Jim Mattis said the U.S., U.K. and France took "decisive action" to strike the chemical weapons infrastructure. He said the strikes demonstrate "international resolve to prevent chemical weapons from being used on anyone, under any circumstance, in contravention of international law." Mattis said the military targeted Assad and went to "great lengths" to avoid civilian or foreign casualties. The assault was twice the size and hit two more targets than a strike that Trump ordered last year against a Syrian military airfield. A scientific research centre in the greater Damascus area, which an official said was being used for research and development of chemical and biological warfare. A chemical storage facility west of Homs, which the military had assessed to be a location of sarin and production equipment. A site in the vicinity of the Homs target, which had been assessed to be used for chemical weapons storage and a command post. Mattis said there were no reports of U.S. losses during the airstrikes. The British defence secretary said the strikes were highly successful and thinks they will have an impact on what Syria can do in the future. He also asked Russia to use its influence with Syria to bring an end to the conflict. Prime Minister Justin Trudeau issued a statement condemning last week's attack on Douma in the "strongest possible terms." He said Canada supports the decision by the three countries to "take action to degrade the Assad regime's ability to launch chemical weapons attacks against its own people." "We will continue to work with our international partners to further investigate the use of chemical weapons in Syria. Those responsible must be brought to justice." The strikes come after days of heated rhetoric. Earlier this week, Trump said on Twitter that there would be a "big price to pay" for Douma and, in the days since, tensions rose amid heated debate about what happened and how, or if, to respond. Speaking at the United Nations on Thursday, Russian Ambassador Vassily Nebenzia said the top priority had to be to avert a wider war — but he didn't rule out the possibility of a U.S.-Russia conflict. Nebenzia's remarks came after Russia's ambassador to Lebanon, Alexander Zasypkin, offered his own threat, saying, "If there is a strike by the Americans then… the missiles will be downed and even the sources from which the missiles were fired." The Organisation for the Prohibition of Chemical Weapons has dispatched a fact-finding team to Syria, and they were expected to start their probe on Saturday. Russia's foreign affairs committee chair Konstantin Kosachev suggested that the strikes were an effort to disrupt the team's findings. 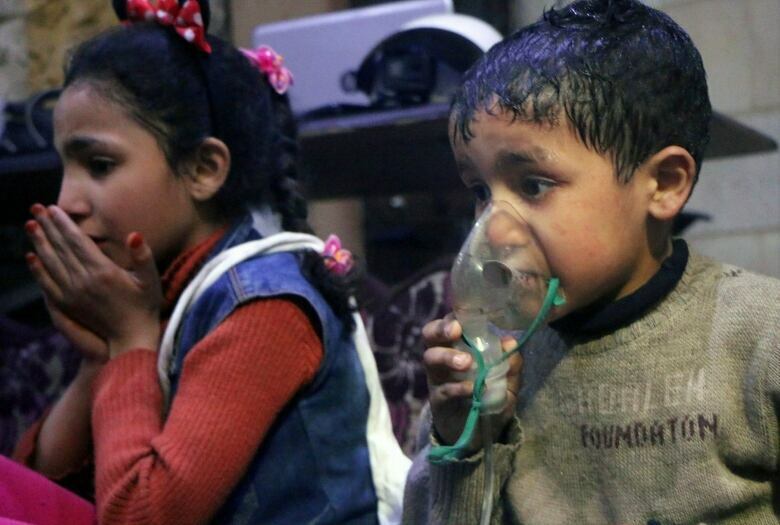 The World Health Organization (WHO) said this week that reports from health partners suggested that during last weekend's shelling, an estimated 500 people "presented to health facilities exhibiting signs and symptoms consistent with exposure to toxic chemicals." The patients presented with "severe irritation of mucous membranes, respiratory failure and disruption to central nervous systems of those exposed," the WHO said. This isn't the first time Trump has retaliated against Syria over chemical weapons. Around this time last year, Trump launched dozens of Tomahawk missiles at a government-controlled airbase in central Syria in response to a deadly chemical attack that killed dozens of people.